During a game of Never Have I Ever, Ellen DeGeneres asked the men if any of them ever "hooked up with a Spice Girl"
NSYNC said "bye, bye, bye" to many of their best kept secrets during a game of Never Have I Ever on "The Ellen DeGeneres Show" Tuesday. Justin Timberlake, who was slated to make a solo appearance on the talk show, surprised DeGeneres and audience members by bringing out his fellow NSYNC bandmates — Joey Fatone, Chris Kirkpatrick, Lance Bass and JC Chasez — tearin' up the hearts of fans in the process. During a game of Never Have I Ever, DeGeneres asked the men if any of them have ever "hooked up with a Spice Girl." Timberlake hesitantly turned his paddle to read "I have." The "Say Something" singer would not reveal who. All five band members confessed to having hooked up with someone on a tour bus, but none of the them have ever hooked up to an NYSYNC song. They also revealed which bandmates have forgotten song lyrics on stage and who among them has joined the "mile-high club." The group reminisced about their embarrassing wardrobe choices during the early days of NSYNC, and opened up about the last time they performed together at the MTV Video Music Awards five years earlier when Timberlake was honored with the Vanguard Award. "We were told at first we were just singing, by the way, and me and Joey were like 'cool, we can step touch, it's gonna be great,'" Kirkpatrick said of the reunion. "Then the choreographer shows up and we were like, 'wait what?' A lot of Tylenol." The group sold more than 72 million albums worldwide before disbanding in 2002. On Monday, they received a star on the Hollywood Walk of Fame. "It's surreal," Joey said of their newly minted star. "You always look at all the people that are on there and think one day it would be nice to have that...It's a legacy that we're living." 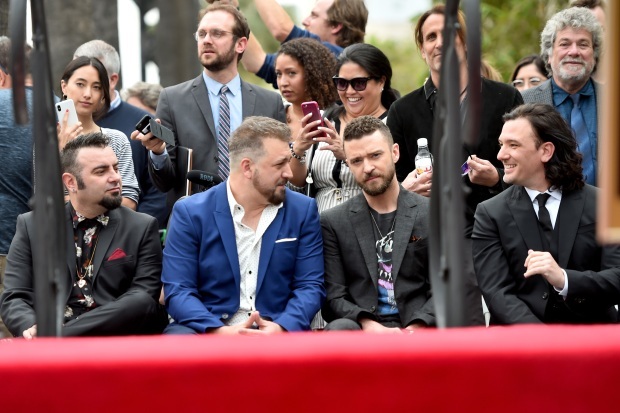 Thousands packed the Hollywood Walk of Fame to watch NSYNC get a collective star on the boulevard. Kim Baldonado reports for the NBC4 News at 6 Monday, April 30, 2018.